It is a rare and wonderful occasion to be able to step into the past - and that's just what happened when Joey and Nova came upon a 1950's home in a historic Tucson neighborhood ... in original condition. 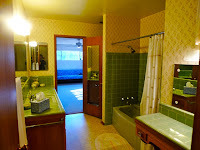 Hidden under a single layer of 1970's wallpaper and linoleum, they discovered original finishes ...perfectly preserved... from wall paper to wood paneling, exposed beam ceilings, un-scarred brick and mortar feature walls, this virtual time-capsule came to life as each surface was exposed. 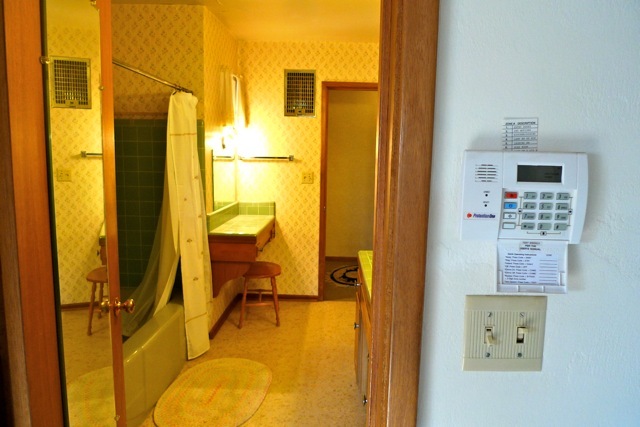 Other 50's relics included the original doorbell, hand-made cabinetry, even the pencil sharpener screwed to the kitchen wall. Because so many features were sound, they decided to only make essential remodeling improvements that would reinforce the 1950's aesthetic of their home. The challenge in the bathrooms was to somehow make ice-cream colored wall tile with pastel cast iron tubs work... In this case, simplicity and history were the keys to a successful result. 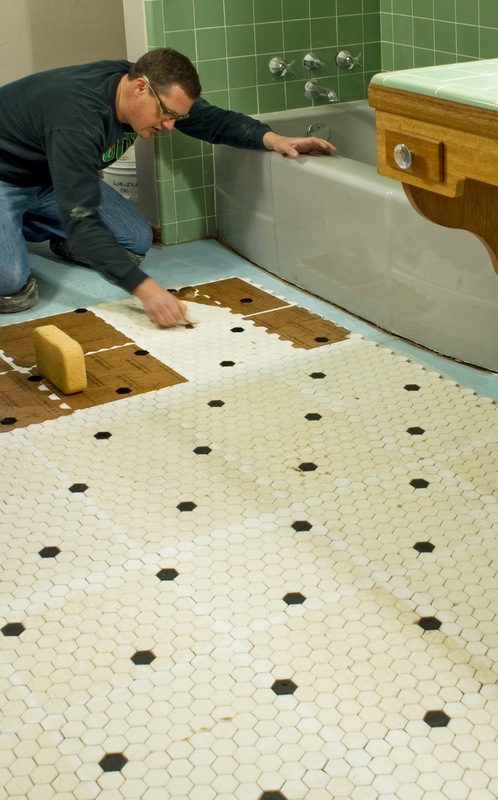 White hexagon mosaics with a black dot insert would do the trick. 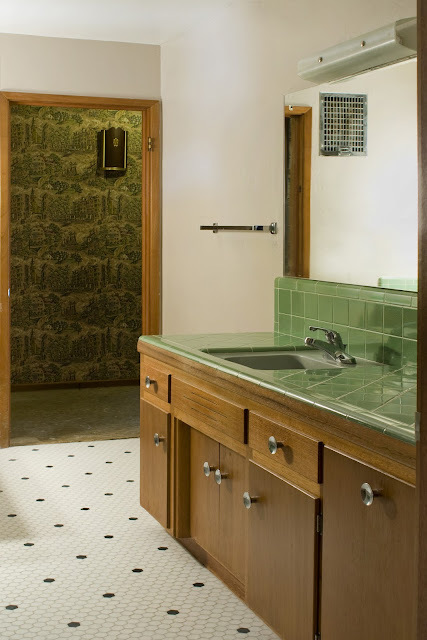 And how do you take a traditional design and add a touch of modern? 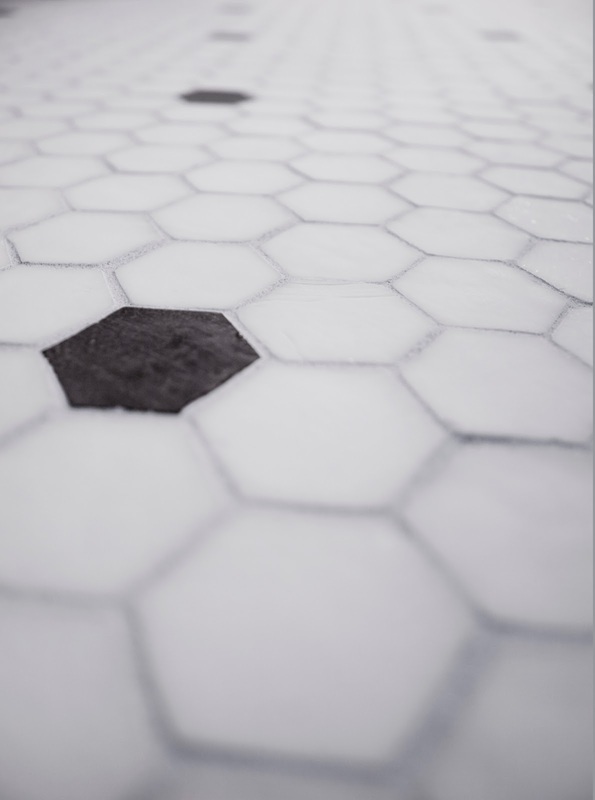 By selecting a textural material like hand-made, tumbled milk glass. Swirls of variegated opacity give milk glass a unique visual texture. Once grouted, the perimeter of each tile is enhanced with 'shadowing' caused by light trapped in the semi-translucent tiles. This effect is most visible with non-contrasting grout. to achieve the aesthetics our clients and their homes deserve. We review the design with our client before installation begins. 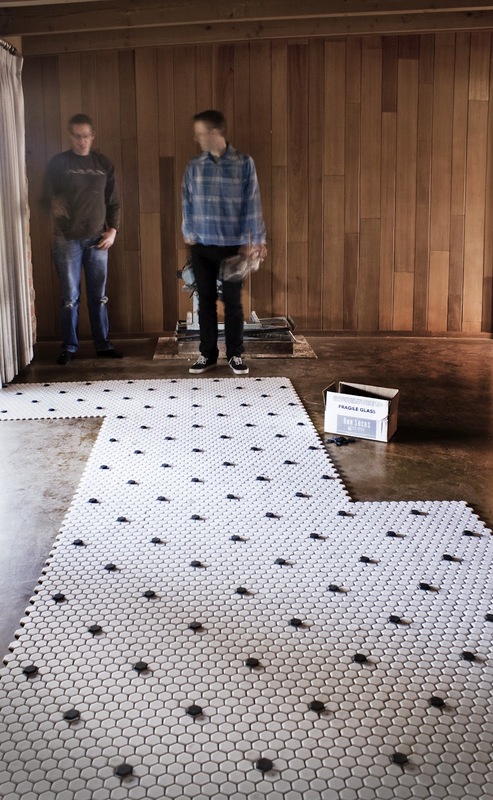 We loft any installation where tile layout is impacted by the dimensions of the room. 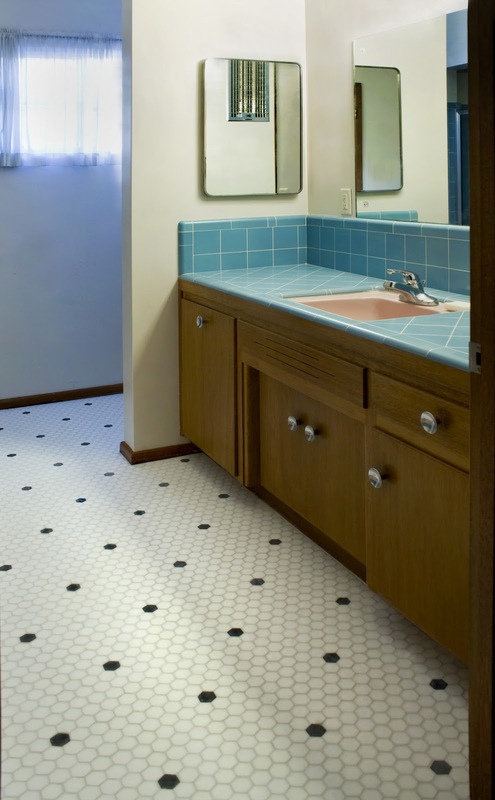 In this case, I don't want black deco tiles to be touching any vertical plane. Once lofted, we can review the design with our client for final input before installation begins. 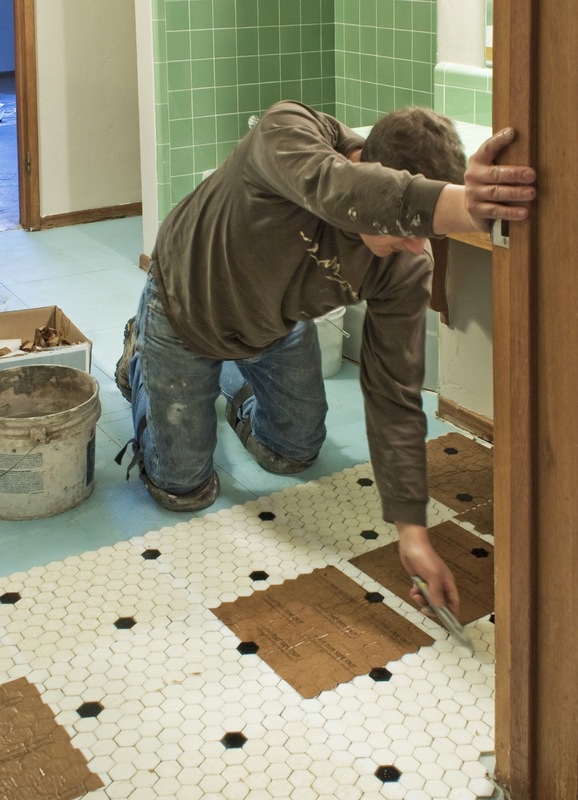 On this project, one bathroom has 2 entries, and ideally the tile layout will be perfectly symmetrical from either entry point. The best way to ensure accuracy is to lay out the sheets in advance, based on the shape of the room - and tweak our design so that it fits perfectly. 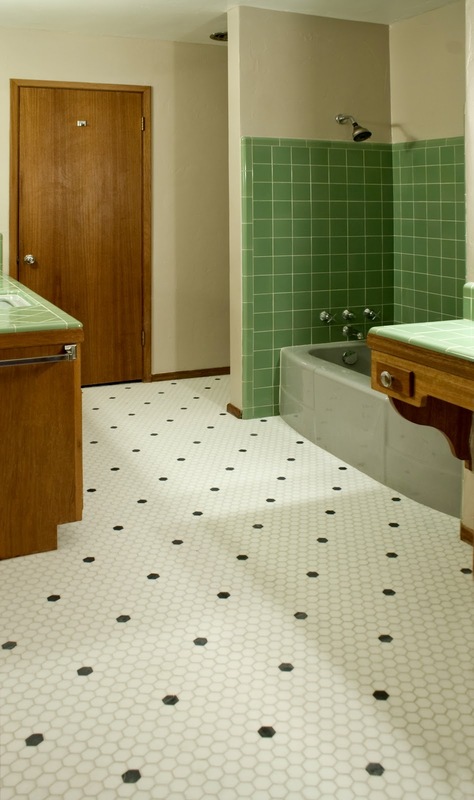 Once lofted, I create spaces for deco tiles and number the sheets. As I hand sheets to Luke, he adds in the black tile deco pattern by hand. This takes guesswork out of installation. 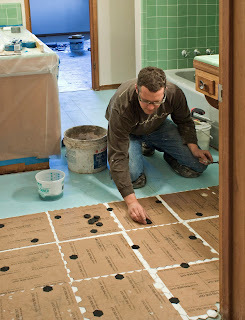 Luke installs the flooring a section at a time, taking time to make adjustments as the paper is removed. Paper Faced mounting systems are by far the best system for creativity and detail work. This system allows the installer to work in batches and make refinements as he goes - the progress can be slower, and the end result is superior. 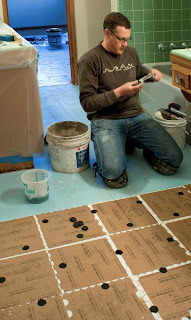 Luke continues to install in batches. We cut in our perimeter tiles on the following day. Because of our planning and lofting, we end up with full tiles, or half-tiles in this hexagon pattern, in much of the room. Cutting in a hexagon pattern can be cumbersome if all the cuts are oddballs. Lofting the floor made cutting easier, faster and more precise. 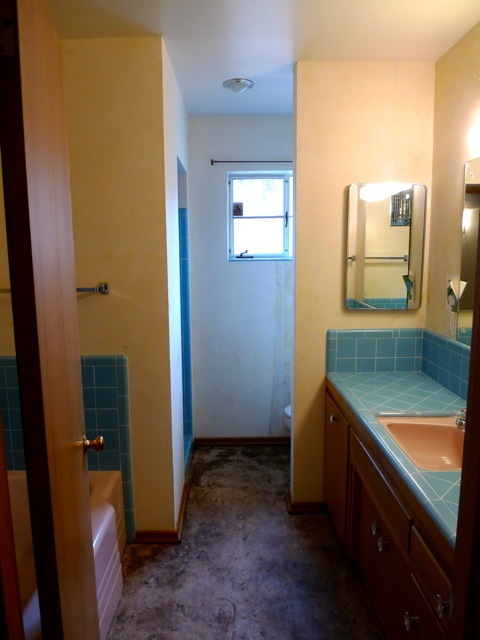 All original...and flooring that fits. After...Bright and cheerful, the kids will love their new digs! We treat every project like it is our finest work, and we are so happy with the end result - where normal practice might be to demo and start from scratch, we enjoy the challenge of taking something old, and giving it a second life.